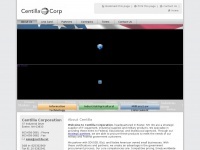 Centilla Corporation is a certified woman owned small business and a supplier of IT equipment, industrial supplies, military and aircraft components. The web server used by Centilla.net is located near the city of Scottsdale, USA and is run by GoDaddy.com, LLC. There are many websites run by this web server. The operator uses this server for many hosting clients. In total there are at least 165 websites on this server. The language of these websites is mostly english. The websites of Centilla.net are hosted by a Microsoft-IIS server and were developed in the programming language ASP.NET. The markup language of the website is XHTML 1.0 Transitional. Due to the robot information on the webpage, the following actions by webcrawlers are not allowed: using the description of the website from the Open Directory project. Both the inclusion of the website in search engines and follwoing of its hyperlinks is explicitly allowed.